When you put a bunch of corporate executives in a boardroom and tell them to design or redesign the company website, you’ll likely end up with a site that only they will find usable. Smart companies know that if you’re building a site for “outsiders” (customers, prospective customers, job seekers, etc.) than you really need an outside opinion of what makes a great site. To that end, there are many companies that will pay YOU to review their websites and give your candid opinion of what you like and what you don’t. Essentially, you’ll need to download an application that will record what you are looking at on your computer screen (their site), and your voice as you navigate their site and voice your opinion of what you see. Some will also capture your image so they can see your reactions to their site in addition to hearing them. A computer with a microphone, high-speed internet connection, up-to-date version of your browser (Chrome, Safari, Firefox, etc. ), and a clear speaking voice. 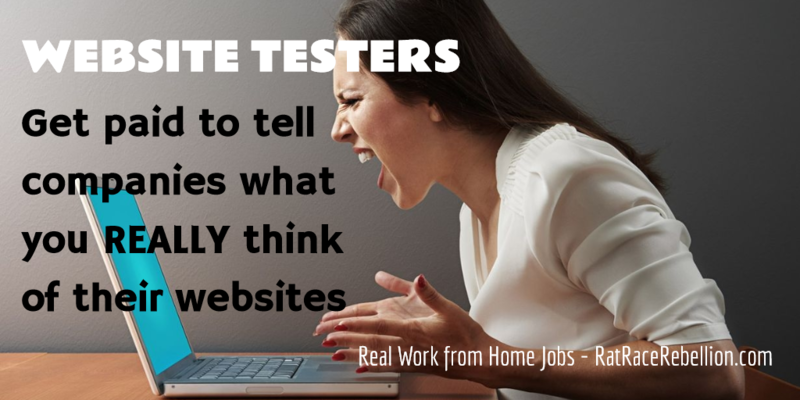 Pay varies from site to site, with some offering “quick test” options that pay a little less, and others with deeper feedback options that pay more. Read through each site carefully to find the ones you feel are the best fit for you. This entry was posted in Crowdsourcing, Set Your Schedule, Work at Home Jobs and tagged website testers. Bookmark the permalink.